As the demands from stakeholders for consummate leadership and good governance from a company's board of directors, its CEO, and its executive team increase, how the process of CEO succession is carried out has become more critical than ever before. Yet, over the past several years, a growing number of CEOs have failed early in their terms, often with devastating consequences to their companies and stockholders. By far the most common problem is a lack of ownership of the CEO succession process. Inside CEO Succession provides businesses, leaders, and boards with the strategies they need to execute their responsibilities with a heightened level of professionalism and ensure the sustained success of the companies they serve. 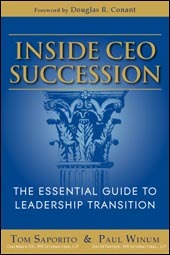 Written by Dr. Thomas J. Saporito, CEO of RHR International, and Dr. Paul Winum, Senior Partner of RHR International, the lessons of Inside CEO Succession are rooted in RHR's long-standing history of bringing expert knowledge, experience, advice, and counsel to the issues related to CEO succession. The culmination of RHR's 65 years of experience providing expert counsel to the boards of directors of hundreds of companies, it explains how ego, role-relationships, power, and human dynamics associated with relinquishing leadership, preparing successors, and ceding power and authority to other people create undetected problems in the succession process and ultimately cause many CEOs to fail early in their tenures. To be successful, CEO succession requires a well-defined course of action that ensures that a number of highly capable candidates are ready to assume the chief executive position whether through an unexpected event or a planned transition. Inside CEO Succession is designed to help boards comprehensively manage that process and effectively sustain their company's profitability. 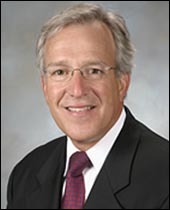 Dr. Saporito was named Chairman of RHR International in 2009, in addition to his role as CEO, the position he assumed in 2008. He was elected to RHR’s Board of Directors in 2006. Since joining RHR in 1979, Dr. Saporito has been involved in virtually every aspect of the organization. In addition to his consulting duties, he managed the Philadelphia office for 10 years, before advancing on to serve as a Senior Vice President responsible for North America’s Eastern region and, subsequently, International operations. Task forces under his direction have shaped several strategic initiatives that continue to impact daily business practices.